The triphibians have their origin in a delightful Japanese film with numerous titles, the most common in the U.S. of A. being The Monster from a Prehistoric Planet. Another title (Gappa: The Triphibian Monster) refers to the monsters in question being triphibians. I really dig that word, so I decided to make them into more useful monsters for the average fantasy/sci-fi game – i.e. I resized them as humanoids rather than uber-massive kaiju. Here then, are the triphibians, compatible with Blood & Treasure and other OSR games. Triphibians look like beaked humanoids with scaly skin and large wings which they can fold onto their backs, nearly hiding them. They are emotional creatures, and their scales change colors to match their emotions. They are not desirous of contact with other species, and do their best to maintain a wide buffer between their lands and those of other creatures. In their own territory, they are highly aggressive towards intruders, especially when they are protecting their eggs and their young. In battle, they fight with swords, spears, bows and javelins, and sometimes use shields. Triphibians can fly and they can breath underwater, making them a triple threat. Nations that have gone to war with them find their skies blackened by their warriors dropping heavy stones or bombs, and their boats falling prey to their attacks from underwater. Triphibians do not believe in fair fights, and use their abilities to the fullest to get an advantage. 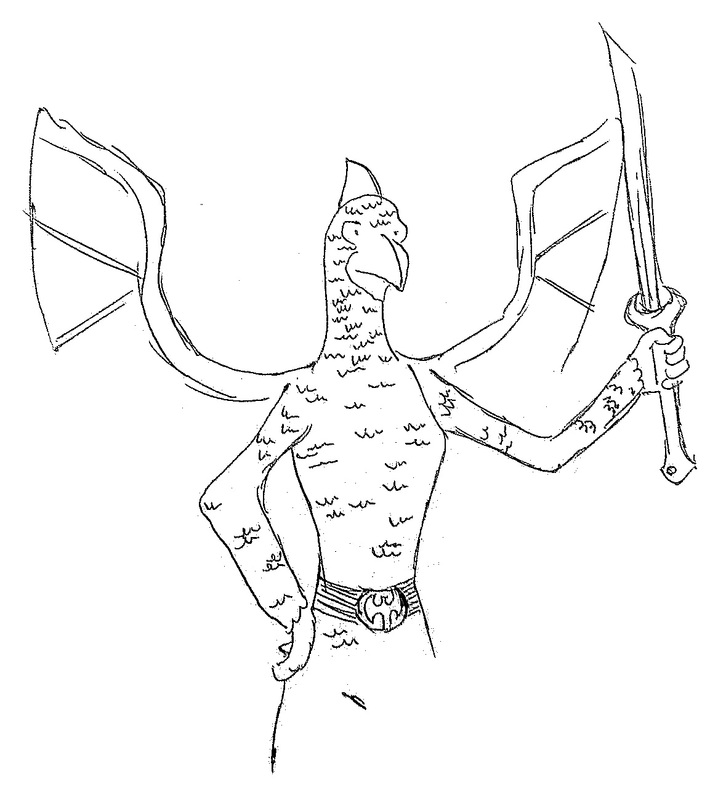 Triphibians dwell in tribes of 1d6 x 60 warriors and twice as many noncombatants. They usually make their home underwater near thermal vents or in secluded mountain strongholds near lakes. It is not unusual for 1d6 tribes to live within a mile of one another, forming a confederation. Triphibian tribes are commanded by a 6 HD king or queen who can breath a 10′ cone of electricity (2d6 damage) three times per day. These kings and queens undergo a secret ritual that increases their size to Large and their intelligence to High. The king or queen is attended by a bodyguard of 3d6 warriors with 2+1 Hit Dice. There is a 36% chance that a tribe has a spell caster, usually an adept (roll 1d4 for level). This philosopher, as the triphibians call them, is a spiritual teacher to the people, attends the king or queen on matters of state, conducts public rituals (including coronations) and joins the tribe in battle. NOTE: These monsters would work very well in a PARS FORTUNA campaign, substituting for the larger humanoids like gnolls and bugbears that appear in traditional fantasy. By adding ray guns and such to their weaponry and putting them in serene bubble architecture above or below the sea, they would also work in a sci-fi setting such as Space Princess.